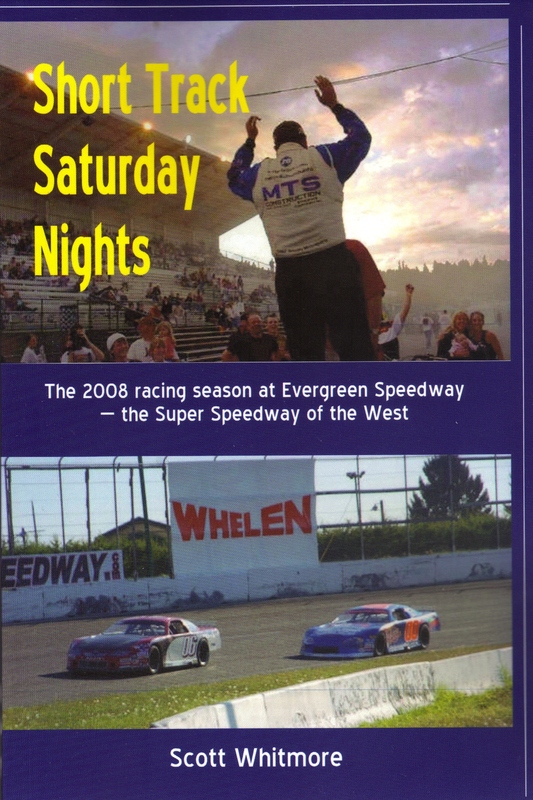 Taking the suggestion of a neighbor who had self-published a children’s story, I approached the management at The Herald with the idea of putting together my articles from the 2008 racing season at Evergreen Speedway, our local NASCAR home track. The paper’s editors graciously granted permission to use my newspaper and blog copy, and I added some original content to complete the book, which I published in November 2008. Crawling out of his car after winning the feature race, both arms automatically shoot straight up in the air in a salute that is equal parts triumph and pure joy. 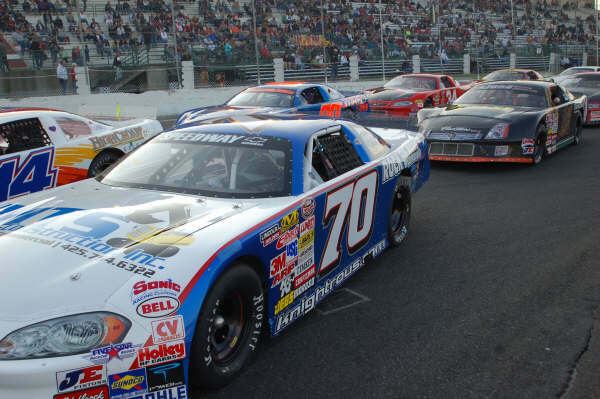 Jeff Knight danced around the car, parked diagonally on the frontstretch, directly in front of the grandstands at Evergreen Speedway — his track — happy beyond measure at the accomplishment. The cheers from the crowd — a group that knows and loves local racing, and the significance of the accomplishment — are muted inside his racing helmet, but he can see them standing and clapping. After climbing the podium to receive his winner’s trophy, the words come out in fits. First in a rush, then slower, then back to a rush as more friends, family, sponsors are remembered to thank. The win, which came in just Knight’s second full year of racing late-model cars, will be dedicated to his wife or daughter, or his parents who have passed away, or the members of the church that he leads. He is in his mid-30s, and the chances he will race at anything but this level — local home track or the occasional regional touring series event — are remote. But he doesn’t care. He races for fun, to test himself, and to lose himself in the rush of competition. He has said the track is his sanctuary, a brief respite from day-to-day responsibilities and cares. For all that, he will always be who he is. Earlier that evening he offered a prayer at the drivers meeting. Anyone — driver, family member, official or fan — need only ask for his assistance or support to receive it. 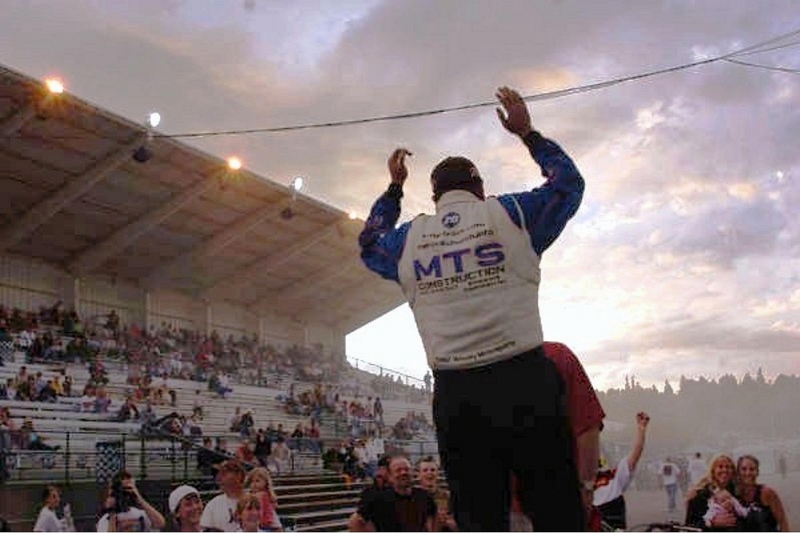 Well-known in the community he lives, works and races in, cheers erupted from different spots in the grandstands when his victory was assured on the final turn of the final lap. Later that evening, when other racers are on the track, trying to find their own win, Jeff Knight will roam through the grandstands, shaking hands and clapping backs. His voice will be hoarse from the yelling and celebrating. Short track racing on a Saturday night. I’d love a copy, please let me know if it would be possible to get one.